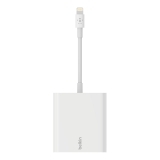 Ethernet + Power Adapter with Lightning Connector is rated 3.0 out of 5 by 5. Rated 4 out of 5 by toddtm from Works but is limited by cable length unless... Tested with iPhone Max, iPhone X and iPad 2. 1GB Bandwidth Internet Connection. 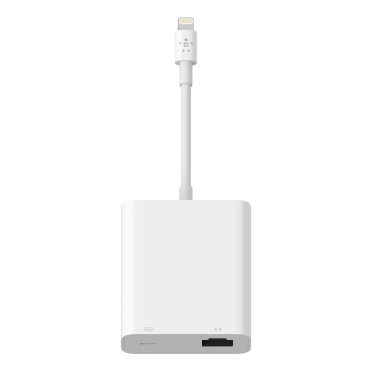 Negatives… The cable is too short and the adapter is huge. 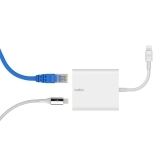 It doesn't make sense to hold an iPhone/iPad with this thing hanging underneath it plus the Ethernet cable. Even for kiosk use it is not long enough. Should have been at least longer. There goes one star off. Positives… Using SpeedTest I get 122Mbps down and 230Mbps up. 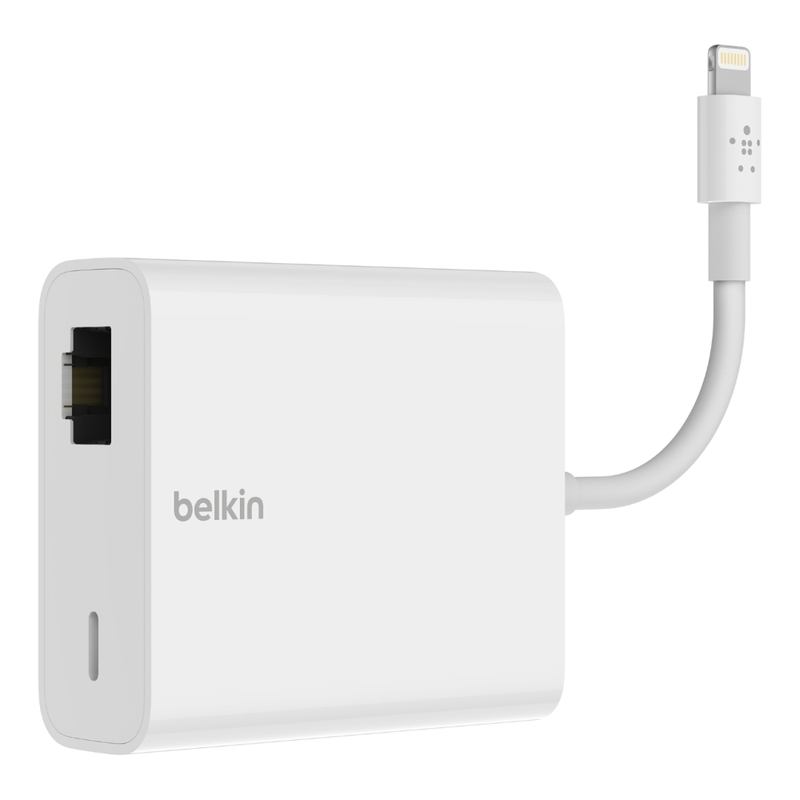 I have used a couple of other Lightening/Ethernet adapters and the best attained is 100 up/down. 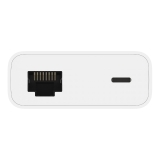 With those adapters my switch connects at 100BaseT. Which is what they advertised. With this Belkin my switch shows Gig connection. Which explains partly the better speed but no where near 480Mbps as on the description page. It does work over POE so that means you don't have to use the Lightening connector to charge if you have a POE switch. Nice! To counter the short cable I bought a male to female Lightening extension cable. With a 6 footer that has all 8 pins connected I can leave the adapter far away and overall I am satisfied. 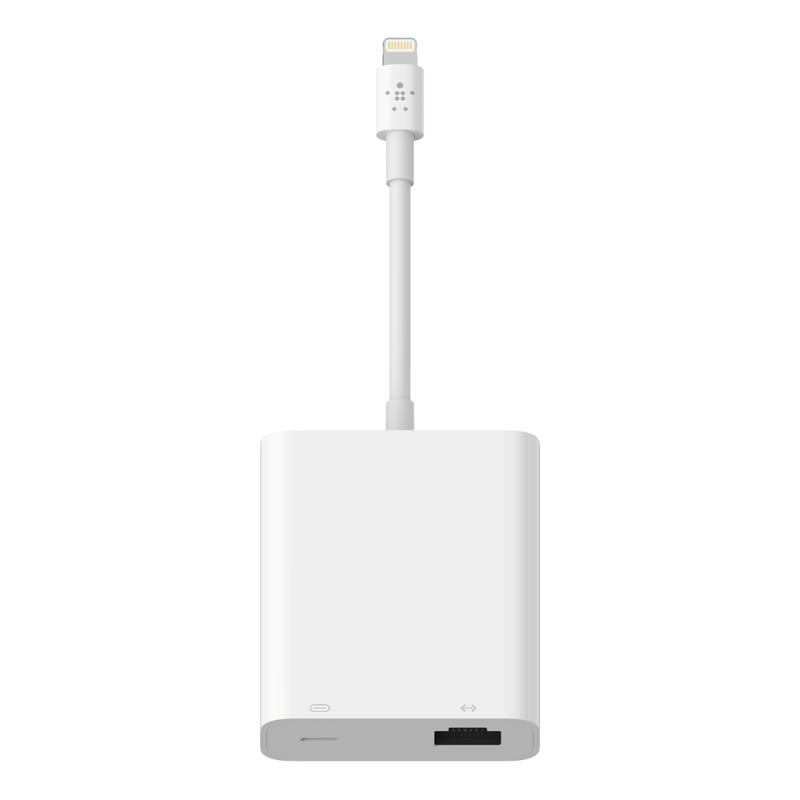 You will lose some watt charging but that can be compensated with a quality extension cable. While it would have been nice to have closer to 500+ Mbps, this is fine for now. I put it in airplane mode and my EMF is almost zero. 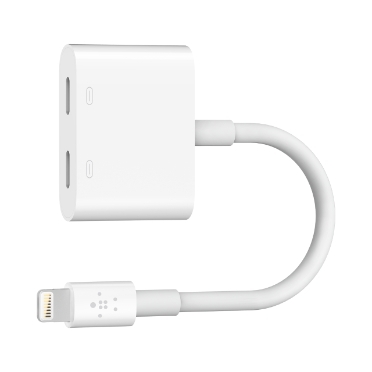 Would be great if IOS allowed calling, and Facetime with Ethernet. Messaging works but only for receiving. Perhaps IOS 13 will fix it. Rated 2 out of 5 by m0dest from Not "480 Mbps Ethernet" First, the product description is not accurate. 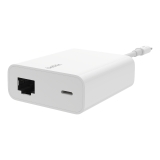 It claims multiple times to offer "480 Mbps Ethernet" but is actually even capable of connecting via 100 Mbps Ethernet. Any expert would assume that "480 Mbps Ethernet" would be Gigabit Ethernet being rate-limited by 480 Mbps USB 2. Second, the throughput is not even close to 100 Mbps. Speed tests measure 5 Mbps (!). Normally, when connected to the same network over WiFi 802.11ac, it achieves 400 Mbps. I'm returning this product. Rated 2 out of 5 by Mike18 from Works -- But not at the advertised speeds Pros: Easy to use. Just plug it in and it works. Cons: Bulky, awkward shape/size. Speed is nowhere close to 480 Mbps. 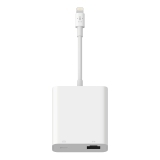 Rated 5 out of 5 by MD314 from Worked instantly & flawlessly on connecting Bought 2 last wk. Arrived today. Tried with my iPad5, iPad Mini4, and iPhone XS MAX. 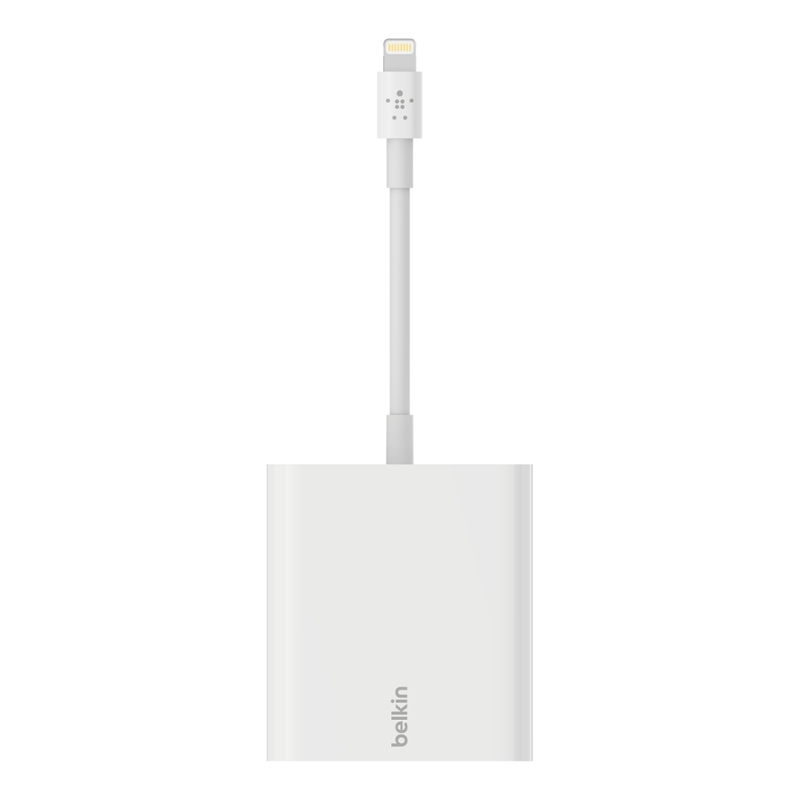 The adapter instantly & flawlessly established an ethernet connection with all of them. It WORKS! Now finally, I have a choice about using WiFi around the kids! Rated 2 out of 5 by clegger from Too short! This is a great idea for P.O.S. 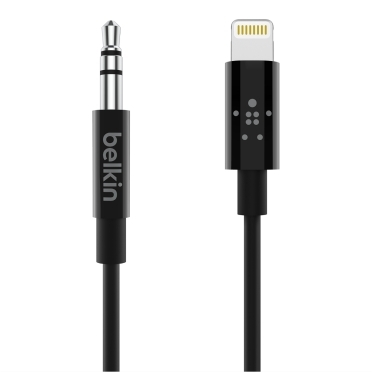 systems, but goodness why is the cable so short, or why does Belkin not also make or include a female lightning to male lighting cable that's MFi-certified also? I was about to use this for my setup, but no ma'am, not with that huge thing hanging off like that. I want it neatly hidden away under the desk with one cable coming up. 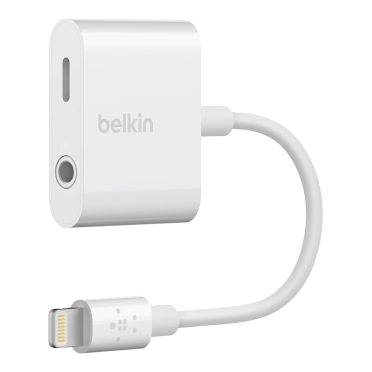 Please Belkin make a MFi-certified lightning extension cable! !